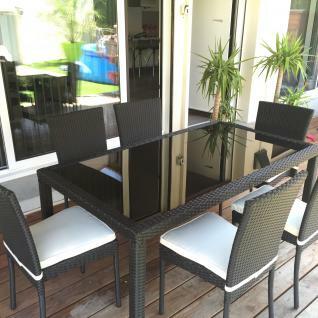 Bergamo Garden Table Set, Aluminium top with 6 armchairs. 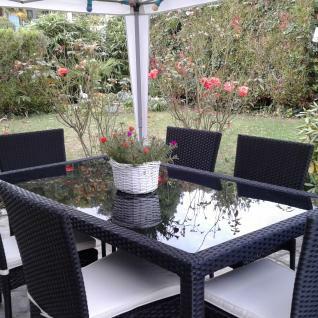 The Bergamo is a classicaly Italian inspired garden table set consistIng of a table and 6 chairs with a aluminium frame and a Polyrattan exterior. It will suit either inside your home or outside thanks to its clean line finish, rattan design and flexibility. A beautiful edition to any setting yet functional for entertaining. A perfect complimentary garden table set for all to enjoy. A great editon to any home, the Bergamo is timeless yet modern. It is possible that the colour shown in the reference images differs from the original models due to the fact that our products are manufactured and receive colour treatments in different factories.